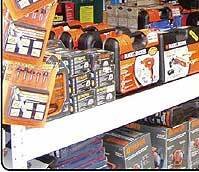 Hardware Store Display configured with Madix Shelving, Wide Span and Pallet Racking. The most effective Hardware Store Displays is configured from what is known as Madix Gondola Shelving that is available in either a double sided or single sided unit, and can be configured as an End Cap for a double sided aisle end display. 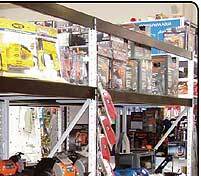 Gondola Shelving is widely used in most Grocery Stores and is constructed or mostly steel. The Gondola Shelving will display most of the merchandise in any Hardware Store. Madix Gondola Shelving can also be configured with what is know as the Hypermaxi racking system that connects an add on type upright frame to an existing Madix Gondola Shelving Unit to create stronger racking system for storage of merchandise and to display merchandise. 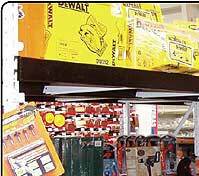 Another popular display for a Hardware Store is the Madix Wide Span Racking used for heavier and larger items and merchandise usually sold in a Hardware Store. The Madix Wide Span Racking is a more heavy duty racking that can not only be used for displaying merchandise but can also be used to store merchandise in bulk pallets or containers. 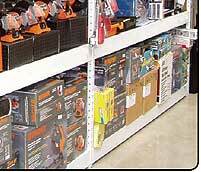 The Madix Wide Span Racking would considered more of a Racking than Hardware Store Shelving.